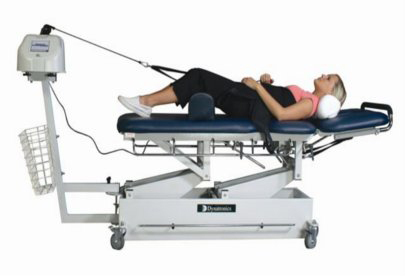 Non-Surgical Spinal Decompression is a revolutionary new technology used primarily to treat disc injuries in the neck and in the low back. It can also be effective for conditions caused by significant arthritic and degenerative disease of the spine, like spinal stenosis. This treatment option is very safe and utilizes FDA cleared equipment to apply distraction forces to spinal structures in a precise and graduated manner. the right shows someone undergoing decompression for the lower back. For the neck, the patient lies comfortably on his/her back with a pair of soft rubber pads behind the neck and a strap that goes comfortably across the forehead. The unit then relieves pressure in the neck by gently applying traction to the cervical region. Many patients enjoy the treatment, as it is usually quite comfortable and well tolerated. (see red arrow on the middle picture). As the vertebra move closer to each other and the disc fills in the space where the nerve comes out of your spinal cord you can suffer from pain in the neck or back and from significant pain or numbness down your arms, into your hands or into your leg down to your foot. Spinal decompression therapy gently separates the vertebrae from each other, creating a vacuum inside the discs that we are targeting (see the bottom picture). This “vacuum effect” is also known as negative intra-discal pressure. This negative pressure may induce the retraction of the herniated or bulging disc into the inside of the disc and off the nerve root. It happens only microscopically each time, but cumulatively, over four to six weeks, the results can be quite dramatic. If you suffer from disc pain or chronic arthritic pain to the neck or lower back, call the clinic to set up an appointment to see if spinal decompression may be right for you.